Well that’s how I feel today as I sit down to tell you about my new eCookbook. I’ve been dreaming about writing a baking book for the longest time. I’ve always wanted to have all the recipes for my favourite breads, cookies, cakes and go-to desserts in the one place. But writing a baking book would mean a lot of baking and a lot of tasting. While baking and tasting are some of the best parts of my job, I wasn’t so keen on the impact this would have on my waistline. But then I had gestational diabetes. And that turned into type 2 diabetes. Along the way, I discovered that it is possible to bake your cake and enjoy eating it too (without wreaking havoc on your blood sugar). I discovered that drool-worthy baking without sugar, gluten or loads of carbs isn’t some impossible dream. It’s easy (when you know how). 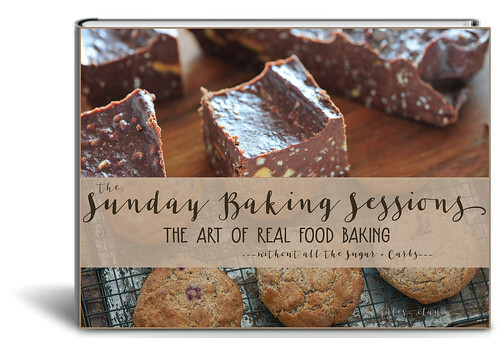 And so without further ado, I give you the ‘Sunday Baking Sessions’! ps. Just don’t tell your family and friends that these recipes are actually good for them. What brand of dark chocolate do you use in this recipe?